Hi everyone! 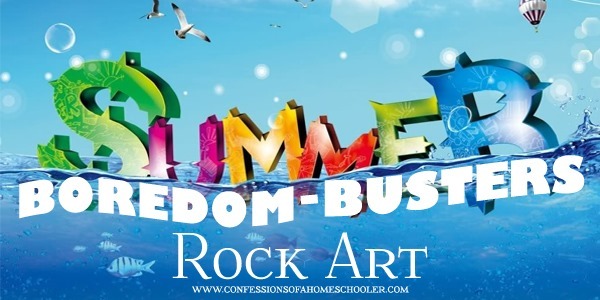 Welcome to day 3 of my Summer Boredom busters series! 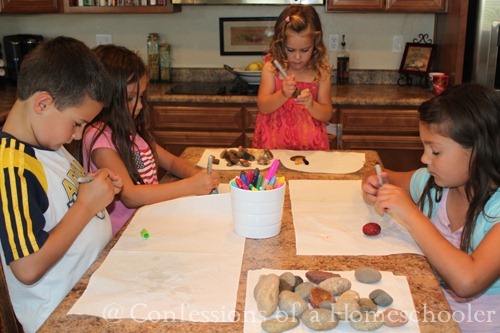 I don’t know about you, but my kids love to collect rocks. And leave them on my table in a nice pile. So I decided to take advantage of that desire to hoard rocks and have them gather any stray rocks found in the grass that my husband just loves to run over with the mower. I figure we’re killing two birds with one stone so to speak. Not that we kill birds. We even made a bird feeder. But that’s later this week. Today we’re making use of all those pesky rocks in our yards! 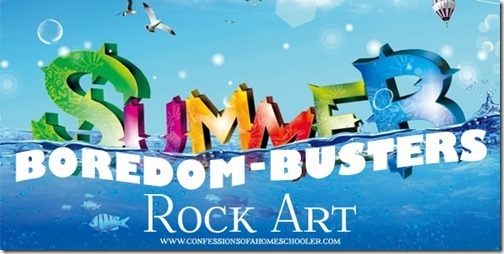 This is probably one of the most “FREE” summer projects you’ll run across. As long as you have some type of markers or paints, you’re all set! 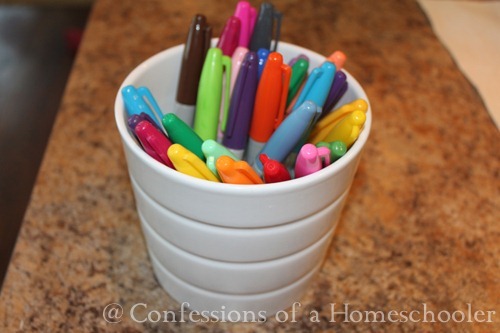 Colorful Sharpie markers or tempera paint and brushes. Send kids outside to pick up rocks. If you have stray rocks in your grass have them grab those first, your hubby will thank you later! Bring rocks inside and wash them in warm water and dry. Let kids paint rocks according to their own imagination! Some ideas would be to create rock people, bugs, faces, race cars, etc! 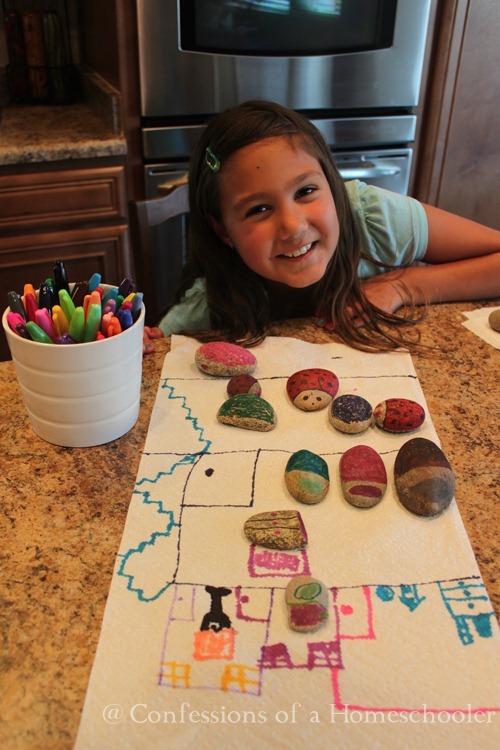 Here are some of our finished rock art pieces. Strawberry Shortcake had the most fun with this one, she even made a little paper house for all of her rocks. So go forth my friends, and gather rocks. 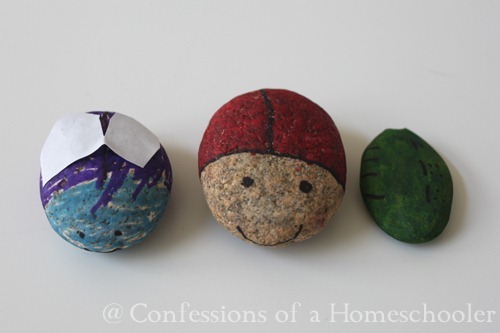 Hope you enjoy your rock collection! One December a few years ago I opened our front door and found a painted rock. The rock was made to look like a baby swaddled in a blanket …. simple design but very effective. I’m not sure who left this rock for us but every year that we put it out with our other Christmas decorations it helps us remember the reason for the season. 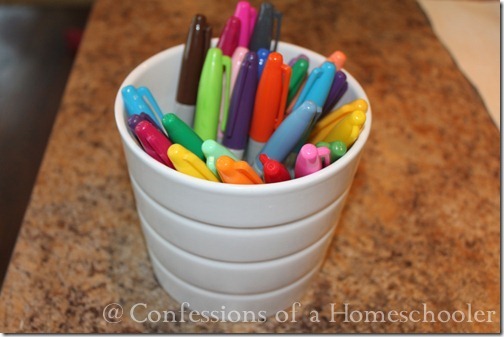 I may use this as a summer project for the kids and distribute them during the holiday season. Something else that is really fun is to bake the rocks for 10-15 minutes on 350. 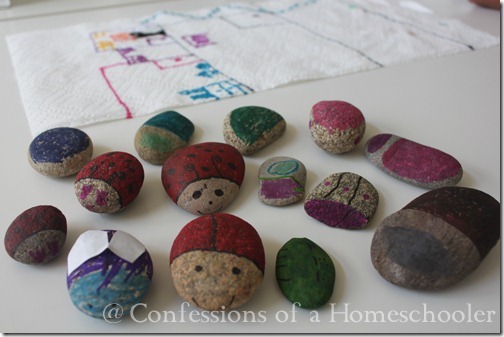 Use old broken crayons and the crayons will melt onto the rocks to make the art. Very fun, but be a little more cautious. I transferred the hot rocks to a cool baking sheet that was lined in foil. The kiddos loved it! Hey Erica. I did the rock art with the kiddos and they had so much fun with it. We even made rock dinosaurs. Thank you so much for the idea.